We’ve just signed a declaration of interdependence. It says that we envision a global economy that uses business as a force for good. That we must be the change we seek in the world. To do so as if people and place matter. To do no harm and benefit all. And to understand humankind is dependent on one another and thus responsible for each other and future generations. OK, wow, great. So remind me what I was going to tell the team in the 4pm review on Eazy-Cheez? It may seem that only certain brands are "do good" brands and one such as Eazy-Cheez can’t put positivity into the world. 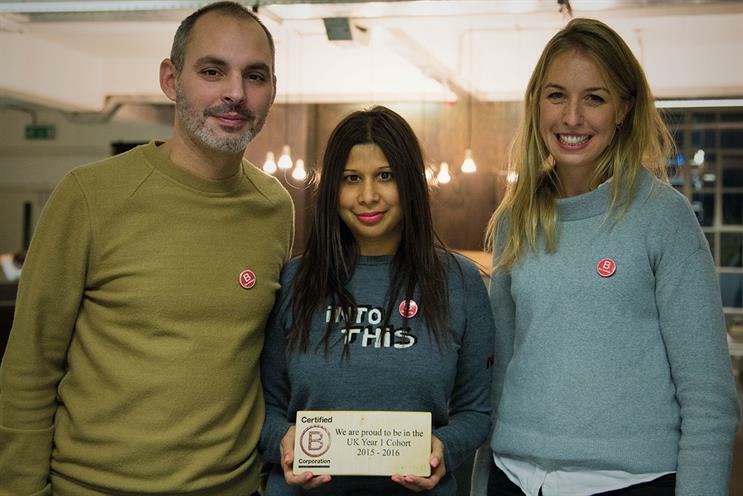 But being a certified B Corp is not just about being charitable. It’s about magnifying the good. Any good. In any situation. For example, a handbook delivered to every kid in the UK to help with nightmares is something Eazy-Cheez could get behind. After all, we know how traumatising cheese dreams can be. The harder part is convincing clients to slice off a chunk of their TV ad budget and pump it into a B Corp-worthy idea. Some clients will get it. Some will squirm, wriggle, shout and ultimately fire you. B Corp is an initiative that finally gives agencies a framework to appropriately vet and select the clients they feel are good partners. That they can do right by while also delivering great business results. Hang on a minute. Ad folk – we don’t have the best reputation. Some might even say the industry is full of devilish characters. Meanies. But, as the saying goes, genius is the ability to hold two contradictory thoughts in your head at one time. Maybe being an ad agency and a B Corp is exactly this contra-diction. Rolling the issue of positive social impact into the middle of a profit-led creative agency is a brief in itself. In fact, it’s the only brief we should be considering. And guess what – when you do it, ideas will start to emerge. Ideas like you’ve never seen before. Here are just a few things we had to do over the past 12 months to achieve B Corp certification. My salary as chief executive must be in a sensible ratio to that of the lowest-paid person in the company (sorry, Sorrell, you will never qualify). All employees receive 37 days of paid leave. Employees must do one week of volunteer work. The agency pays for their time. We allow the use of agency space for charities to do events, training and day-to-day office work. We must regularly meet our suppliers on-site to discuss their environmental impact. We have passed, via the board, a special resolution to amend our articles of association. This means directors of the company have a fiduciary duty to create positive impact alongside the usual limited company duties. The list goes on. We are only scoring 82.6 out of a possible 200 points. We are not saying every ad agency needs to be a certified B Corp. We are just saying roll that ball into the middle of your company because we will be better creative agencies for it – and better humans. There is no shortage of literature to prove that when you take this approach, money follows. Let’s not forget about creativity in all of this. We became a B Corp because it supports our open-minded, compassionate and talented people to do their best work. Beyond the practical changes, we’ve had to square this business of being an ad agency and a B Corp. For now, it’s called "less, better advertising". The abundance of platforms promises sharing and democracy of ideas, and a world where we communicate on a level playing field. What’s actually happening is just loads and loads of targeted nothings spamming us. It’s as though your Hoover flicked to the reverse button and is now hosing you down with dust, dirt and cat hair. Soon we’ll be unable to breathe. The quality of our work: make a simple, brilliant idea go further. Where we should appear: not every space is valid as advertising. From a red-blooded business point of view, focusing on value (not volume) and scarcity (not abundance) drive the price up. It’s idealistic – but which one of us joined this business without ideals?